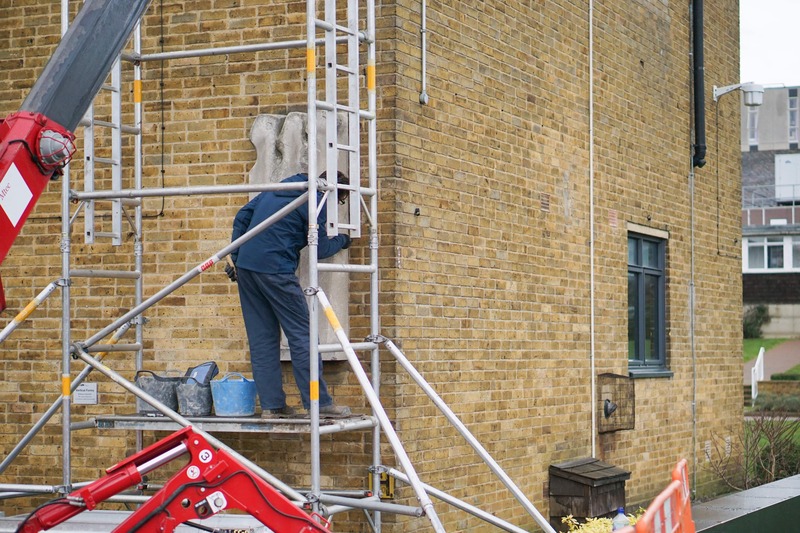 One of the University’s most prized artworks has been removed from the façade of the College Lane main building for the first time since it was created in 1952. 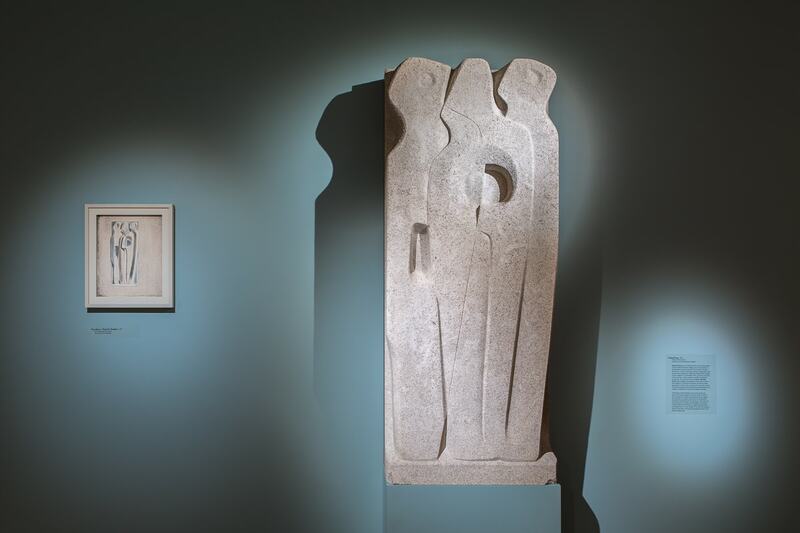 Having been carefully deinstalled and conserved, Vertical Forms by British sculptor Barbara Hepworth (1903-75) is now a key exhibit in Barbara Hepworth: Artist in Society 1948-53 at St Albans Museum + Art Gallery (until 8 September 2019). The exhibition is curated by Annabel Lucas, Head of UHArts and Dr Sophie Bowness, Barbara Hepworth Estate, and is produced by UHArts in partnership with St Albans Museums. Commissioned in 1951 for the façade of the new Hatfield Technical College (now the University), Vertical Forms was installed within the fabric of the building. Contrasting with the strong horizontal lines of the architecture, the carving represents three up-right, interlocking abstract figures. Along with works by Ben Nicholson, Reg Butler and Trevor Tennant, Hepworth’s Vertical Forms is one of the founding works of the University’s Art Collection, which now includes over 500 works dispersed around the two campuses. Thirteen external sculptures can be explored on monthly free guided Sculpture Walks. Vertical Forms now takes centre stage in the exhibition in St Albans which brings together sculptures, drawings and archival material, some of which have not been seen together since they were created 70 years ago. The exhibition focuses on a significant period in Hepworth’s work after the Second World War, when she began to receive wide recognition. A particular connection was formed between Hepworth and Hertfordshire in these years through a number of purchases and commissions, including Vertical Forms. Following the exhibition Vertical Forms will be re-sited at the University of Hertfordshire in a protected, prominent site in order to prevent further weathering of the carved detail and to ensure its preservation for the future. The de-installation and conservation of Vertical Forms (1952) is generously funded by the PMSA (Public Monuments and Sculpture Association) in partnership with The Porthmeor Fund. The exhibition is kindly funded by Arts Council England, The Henry Moore Foundation, The Porthmeor Fund and the Contemporary Arts Practice Research Group (School of Creative Arts).